"As easy as pie is a popular colloquial idiom which is used to describe a task or experience as pleasurable and simple. The idiom does not refer to the making of a pie*, but rather to the act of consuming a pie ("as easy as eating a pie"). The phrase is often interchanged with piece of cake, which shares the same connotation." In this case, though, making the pie is almost as simple (and pleasurable) as eating it. Now I clearly have to figure out how to make a Piece of Cake Cake. 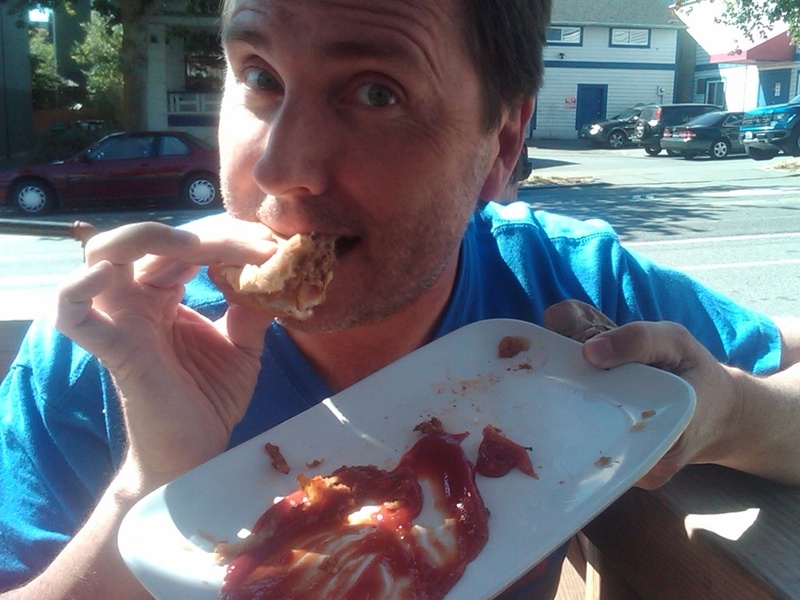 This just in from FG10, who has recently relocated to the great Foodie mecca of Seattle. She has been faithfully eating her way through town, in between settling her three kids into new schools, unpacking boxes, keeping her career moving, and meeting all the neighbors in the modern-day equivalent of Mayberry. What a trooper! Take it away, FG10! My foodie adventures began in Seattle practically the second I stepped off the plane in July. 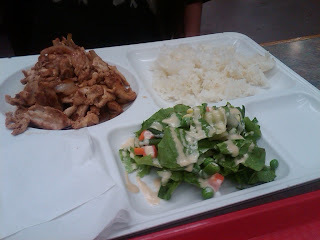 I discovered an amazing Asian market called Uwajimaya that changed my life. The produce was some of the most beautiful I'd ever seen and there was an entire meat section just for perfectly cut stir fry. My kids were fascinated watching the locals pluck any kind of seafood you could think of from tanks and having the butcher prepare it for them...... fish heads were flying! I found my favorite Japanese face cream, Yu-Be, picked up the best peaches I have ever eaten (except for Pike Place Market Sosio's Produce's "Oh My God Peaches" which are truly worth placing an order to be shipped when in season) and then found amazing food court right through the back door. SHILLA KOREAN BBQ was in that food court, right next to a Beard Papa's. We had lunch combos, and the meat was prepared perfectly: incredibly tender and marinated to perfection. It was served with sticky rice, sprouts and Kimchi. Hannah got chicken, which was delicious, but I loved the beef. The owner was super friendly and so concerned we were happy. We wondered if everyone in Seattle was this nice and accommodating. (Mostly, they are!) He asked if this was our first time and helped us order just the right thing. Once we got settled and started venturing out more, we were on the hunt for a couple of things: good summer ice cream and a hamburger that could replace In N' Out. On a friend's advice and positive online reviews, we headed for MOLLY MOON'S ICE CREAM. Making it across University traffic (worse than LA) to a little spot called Wallingford, there it was with the boxer dog face on the sign. The shop was vintage in aqua and chocolate brown and the people working there were scooping fast and furious. The flavors, which rotate seasonally, on our visit were Vanilla Bean, Theo Chocolate, Strawberry, Vivace Coffee, Scout Mint, Salted Caramel, Honey Lavender, and Earl Grey. The ice cream was premium, handmade, super creamy and so rich it was hard to finish the very generous scoop they give you. The vanilla (which my youngest daughter ordered in a waffle cone!) was delicious. My son, though, was disappointed in his Theo Chocolate. It wasn't nearly chocolate enough. Of course, he's a kid who eats Baskin Robbins Chocolate Fudge, so it's hard to find ANY chocolate as chocolate as that! Hannah ordered the Strawberry, and that was the best of all, with chunks of amazing strawberries and just enough cream. It tasted like a bowl of strawberries with fresh whipped cream. I tried the Salted Caramel but it was really heavy on the salt, so a full scoop was a little much. On a future visit we tried Scout Mint, a flavor I think is one of their best. It's just like eating a Girl Scout mint cookie-- so yummy!! In the fall we tried a fantastic Cinnamon and Pumpkin Clove. Thumbs up for Molly Moon's! We were enjoying the sunny day and nice surroundings, but were tantalized by the amazing aromas coming from the kitchen. My name was called, and after that, we hardly spoke. The table went silent as we inhaled and then the gasps began------- UNEEDA------we do! Riley claimed it was the best burger she's ever eaten. Danny looked like he was about to pass out from euphoria, Cayden's lasted all of 5 seconds and I savored every morsel. The fries were delicious with just enough salt. The onion rings were one of the best things about the meal and the shakes were thick, flavorful and refreshing. The burger was clean, not greasy at all and tasted, well, healthy if that's at all possible. The condiments were simple. For me blue cheese, caramelized onions and watercress. When it was all done, we wanted to do it all over. We'd found a winner and have been back every month. So what do you do after pigging out on fries and burgers? EAT PIE! Down the street at PIE we ate ourselves silly and took more home to try. 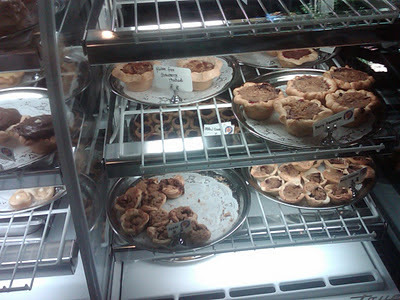 Fortunately, they have mini pies that are no more than a few bites, just perfect for sampling. Choices include peach/blueberry, apple, lemon curd, lime, chocolate cream, peanut butter, cherry, and mixed berry. They have savory pies, too, but honestly? The chocolate and peanut butter were amazingly creamy, flavorful and rich, the crust delicate and flaky. The berry was delicious, too, but my favorites were the lemon and lime, with the perfect ratio of sweet to tangy. Next up, RED MILL. Oprah said it's one of the 20 burgers you have to eat before you die, and it's just 10 minutes from the house. Clearly, a must. Red Mill is an old hamburger joint with a small counter and a line going out the door. Always a good sign, food-wise, but less than thrilling with three kids in tow. 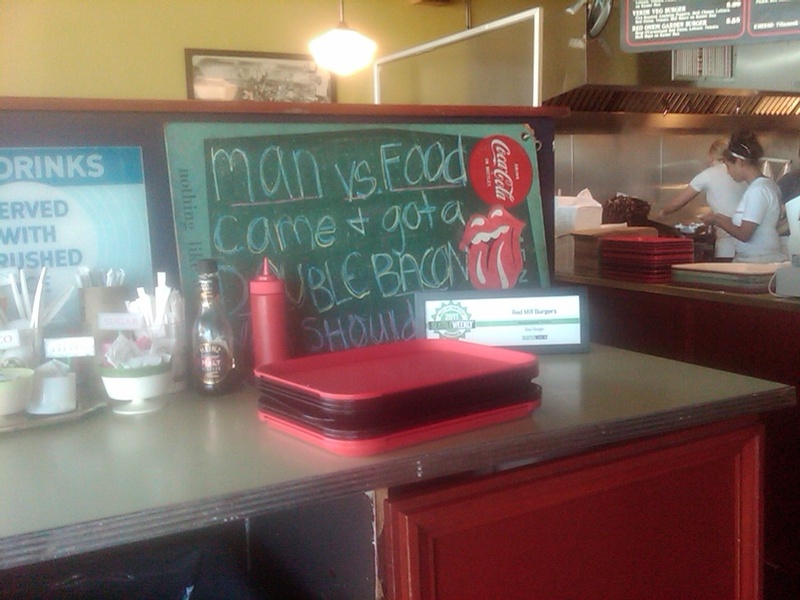 We get to the counter to order and see the biggest stack of bacon you can imagine. There must have been 30 lbs. of bacon stacked up on the side of the grill. But then came the game changer -- a sign that reads: "WE USE PEANUT OIL FOR OUR FRIES." REALLY?? Now we have two sad kids who don't get fries and they immediately wrote this one off. The burgers arrive, very large and very messy, with lots of good sauce, but they didn't wow any of us in taste. LUNCHBOX LABORATORY. This place has been featured in Seattle Magazine as best burger and is in just about every book I have read about Seattle places to eat. My parents were visiting so on a rainy, cloudy day (no, it's not like this every day!) we made our way to South Lake Union. The restaurant sits on a corner in a great little shopping area down the street from the flagship REI store. We greet the very friendly hostess and though very busy, they manage to seat us in about 15 minutes. The decor is fantastic -- recipes for the laboratory are written on chalkboards, and vintage lunch boxes are scattered around the restaurant. There is billiards upstairs and a bar to the right of the restaurant. 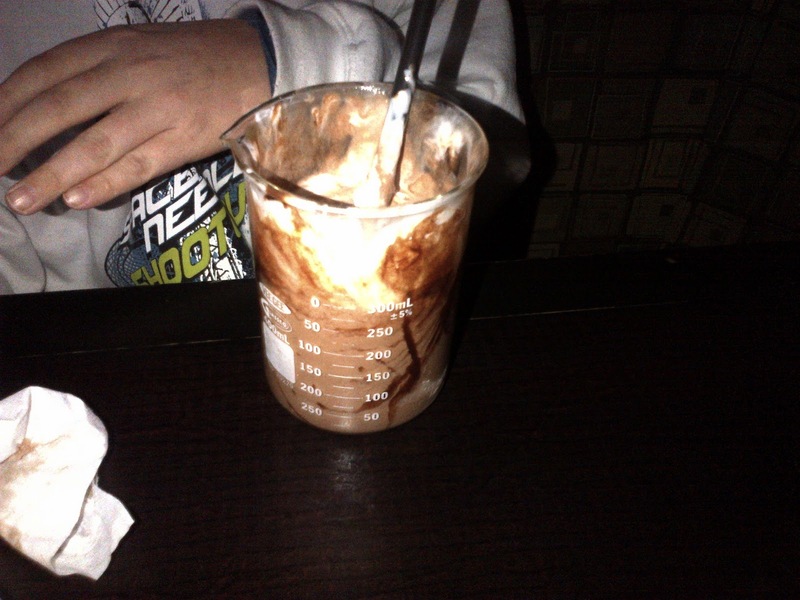 Drinks and shakes (listed as "experiments" on the menu) are served in beakers. We look at the amazing selections and wanted to order everything. We ordered the Mac and Cheese appetizer and Vanilla, Peanut Butter Cup and Oreo shakes. The shakes arrived with a huge helping of real whipped cream, and as everyone sipped away, eyes rolled back in heads. They were amazing! Probably best shakes any of us have ever had. The flavor was crazy: one was a liquid oreo cookie, the next a liquid, creamy peanut butter cup. My dad, who didn't order one, kept sampling everyone else's. The decadent mac and cheese disappeared instantly. The tater tots were cooked perfectly, golden brown and delicious, the sweet potato fries were especially good and the burgers put Lunchbox over the top! In N' Out has found a replacement...... for now. UNEEDA is a very close second (actually first place in my husband's eyes). Both of these are so good that in my opinion it's well worth the $200 fare on Virgin to come try for yourself, fellow foodies! All I can sas is, "Wow!" As I start clicking away on Expedia to get myself up to Seattle, pronto. Thanks, FG10! Don't be silly. Of course we had dessert. Ready? Here it is. 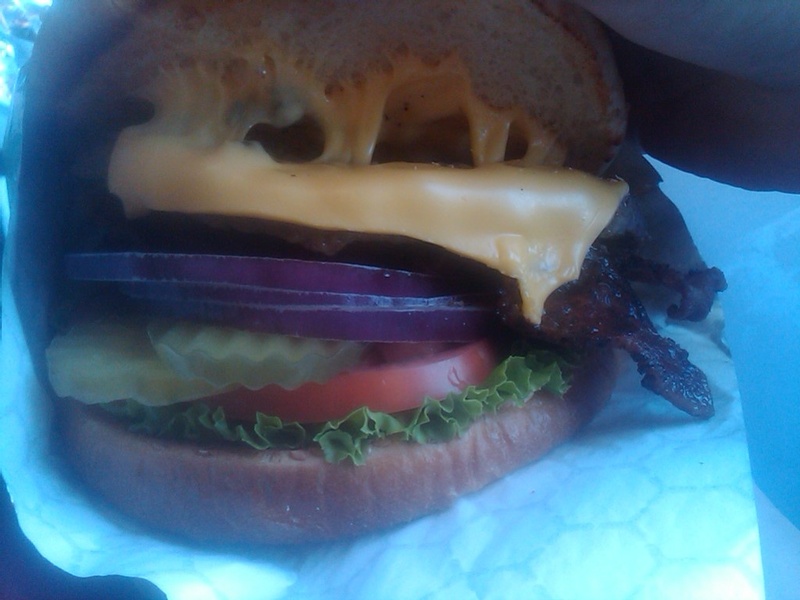 Burgers, schmurgers. Short Cake rocks! Located a quick turn around the corner from Short Order, this cheerful market stall is exactly as it should be. There are colorful painted bundt cake pans on the walls, eye-catching beakers of coffee beans, and tattooed barristas smiling as they work. If I drank coffee, I imagine that all of this would be blowing my mind. As is, I find it to be a lovely decorative accent for the cake. There are piles of cookies in a basket at the counter, and glass cases full of gorgeous goodies. It made me happy just to look at the place bustling away. The overwhelming sense is that you are about to get an after school treat from someone's mom who happens to be the best baker in the neighborhood. Partially it's the handwritten signs nestled into the case, or the visibly moist crumbs on the Brunette slices. It's also the homey mix of offerings. Crumbles and cookies, scones and muffins, bread pudding made with chocolate buns. Breakfast cereal, buttermilk and jam as ingredients, along with the unexpected savory notes of curry in a raisin scone, cardamom cream in a chocolate layer cake, feta cheese in a muffin and thyme and pine nuts topping that dense brunette. And why hasn't anyone invented cashew butter cookies before? Full as we were on spuds, we lined up at the counter and went a little nuts. The brownie was almost too dense and fudge-y for some of us, heavy with coffee flavor, and intensely chocolate. Others loved it. The texture of the breakfast cereal cookie was fantastic. It was crunchy on the outside, but buttery and soft the minute you bit into it. Bits of dried wild blueberries and the light dusting of sugar and spice made this humble-looking cookie a standout. This, though, was our favorite. The buttermilk tart. Five bucks gets you a straight shot to heaven. The crust is simply awesome, first of all. Buttery and sweet and a tiny bit salty, it should be pictured in the dictionary next to "shortbread crust". The custard is bright and tangy and sweet and creamy all at once. Cool to the tongue, smooth and silky, the luscious texture makes it taste that much better. The top was clearly sprinkled with just a hint of cinnamon before baking. This tart, my friends, is what great baking is all about. Nothing fancy...there are probably five or six ingredients in the whole thing... just simple, pure magic. 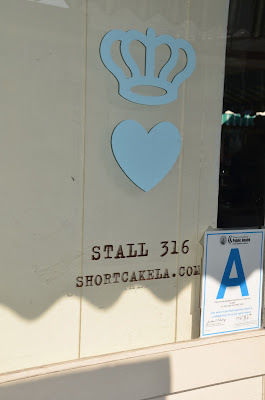 We were also big fans of the genevieve, a dark, crumbly shortbread made with walnuts and sea salt, I took home snickerdoodles and gingersnaps to my family, and let's just say that people were quite happy with me when I arrived. FG6 does advise avoiding the twice-baked brioche with the almond topping. It looked lovely, but was super dry. Just goes to show you, nobody's perfect! FG Final Verdict: Go. NOW! Recipe for their cashew butter cookies is here. Recipe for their orange chiffon cake is here. Inspired by the one I ate at Short Cake, I adapted my go-to scone recipe. The results were so positive that I went and made Curry Oatmeal Raisin Cookies*, too. In a large bowl, whisk together the flour, sugar, curry powder, baking powder, baking soda, salt, and zest, if using. Scatter the cold butter dice on top, then cut into the flour mixture using a pastry cutter or two knives, until mixture resembles coarse crumbs. Stir in the raisins. Add the buttermilk, and combine carefully, using your hands or a wooden spoon, just until dough comes together loosely. Turn onto a lightly floured surface, and knead gently a few time until smooth. Roll or pat out into a rough rectangle, about 3/4 of an inch high. Cut scones out using a biscuit cutter or cookie cutter, and place onto a cookie sheet. Gather dough scraps, pat out again, and continue cutting scones. You should get about 12-15 scones all together, depending on the size of your cutter. Brush the tops of the scones lightly with beaten egg. Using a mortar and pestle, or a spice grinder, crush the curry powder and raw sugar together to combine, and sprinkle the tops of the scones with a little of the curry sugar. Bake for 15 minutes, or until light golden brown. Serve warm or at room temperature, with clotted cream and apricot jam, or all by themselves with a smidge of butter. * Make the dough for Barnaby Day Cookies. Add 1 1/4 c. quick cooking oats and 2 tsp. curry powder along with the dry ingredients, then stir in 1 c. of golden raisins. Bake for 12 minutes at 350. I'd love to, but I'm cleansing. I'm enrolled in three different Boot Camps, Zumba and the unlimited plan at Pilates - It's kind of an emergency. I'll have the water, with a small side of lettuce. No, I'm not expecting again. I had house guests over the holidays. God, how do people watch this show sober? Let me just pop that kale into the blender for you. I have to stay home. 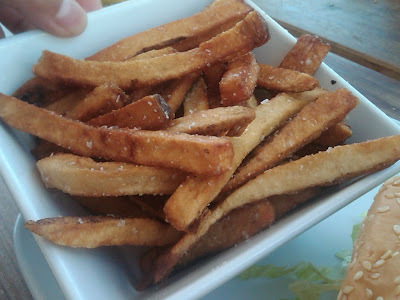 If I go out, I might accidentally run into some French fries at the bar. I'm never eating a cookie again. But, as my kids know, I'm always running a little late. So you might hear me saying a few of these things in February*. Far be it from me to put my need to fit into my pants ahead of the FG's need for a highly caloric lunch outing. 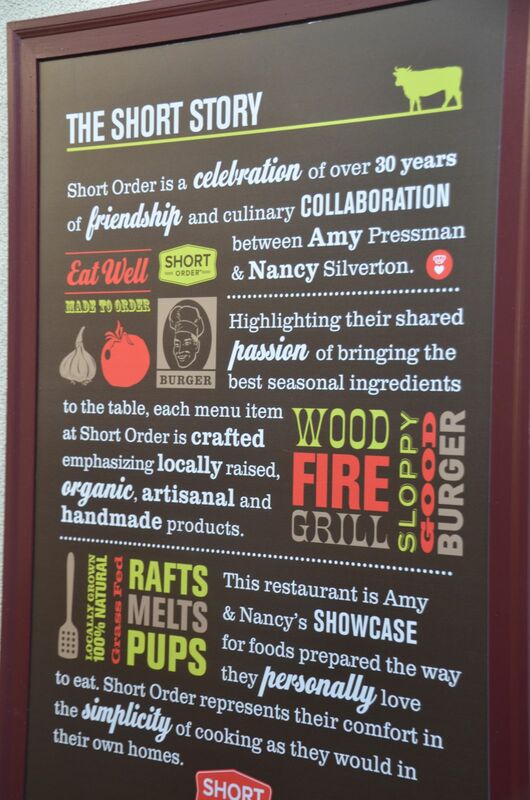 The pre-opening buzz about Short Order, Nancy Silverton and Amy Pressman's new burger joint in the Farmer's Market was nothing short of giddy. 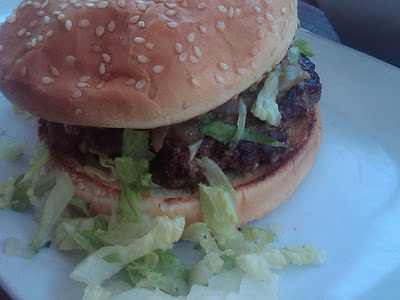 Nancy's recipe six years ago in the LA Times about the perfect backyard burger was revelatory (at least to me), and the Mozza worship would be ridiculous, except that the pizza is really, really good. Reviews on Yelp have been mixed, with some raves and several feeling the prices are far too steep and the burgers were nothing special. Controversy? Burgers? Giddy press? Time for the FG's to check this place out. It was a brisk, bright, breezy day in LA, and at just before noon on a Friday, we had our choice of sitting upstairs in the cozy restaurant or on the small downstairs patio with sleek wooden picnic tables. 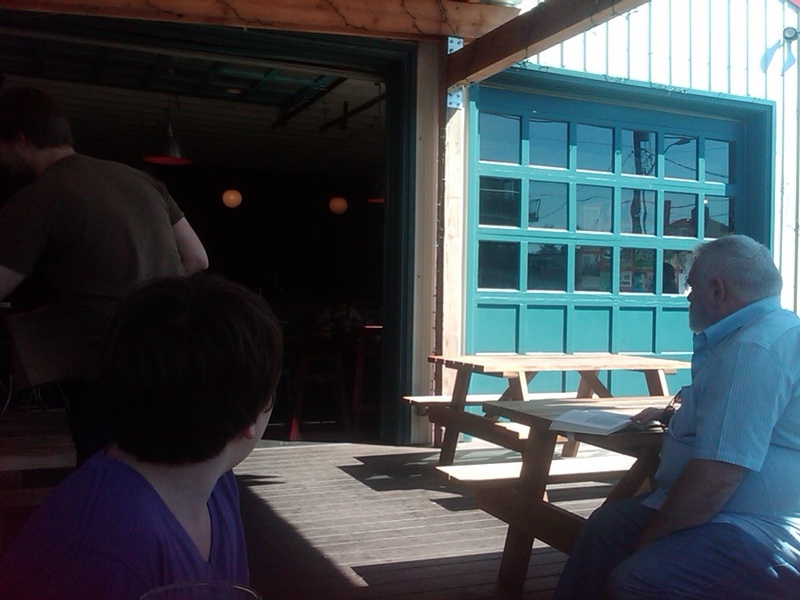 We choose the patio. Menus were rolled up with napkins in mason jars on the tables, and the very friendly server came over quickly to give us their "burger temperature guide" to review while we decided. The menu inaccurately said that their more exotic burgers (lamb, pork, tuna) were only available upstairs, but we soon zeroed in our our lunch plan. There was universal agreement on trying the Market Spuds ("With truffle salt?" "Ooh, of course!!") and the Corn Pups ("I LOVE corn dogs!" "Me, too!") 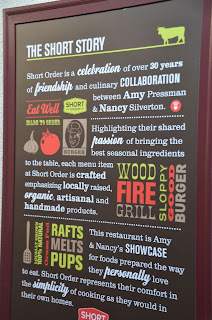 to start, followed by Nancy's Backyard Burger, the Short Order Burger, and a Tuna Niciose raft. FG6 and FG17 like their burgers well done, so we asked for one that way, and the other medium. The tuna we ordered medium rare. 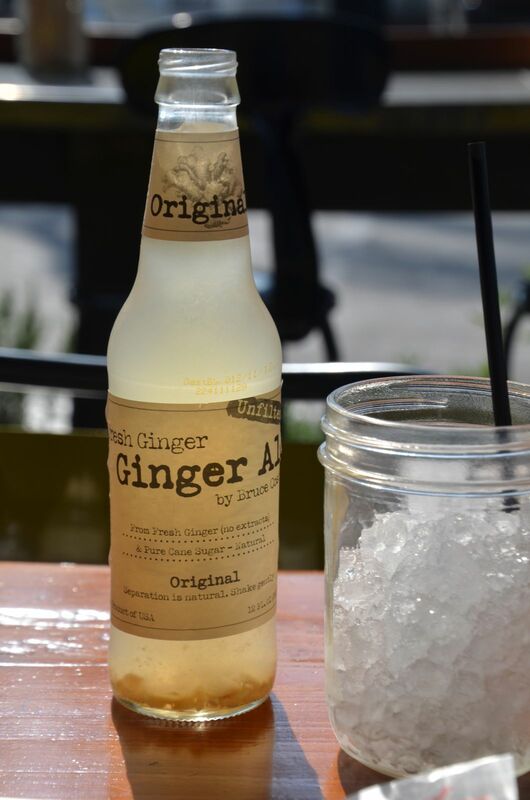 An appalling dearth of Diet Coke (but plenty of water in mismatched glass jars) led me to branch out and order a ginger soda. I have to admit, it was awesome. After we ordered, a couple of us walked around to peek in to see the kitchen at work. There's a huge woodpile next to the wall, apparently fueling the busy grill. Burgers are quickly covered with metal tins, to seal in the smoke as they cook. 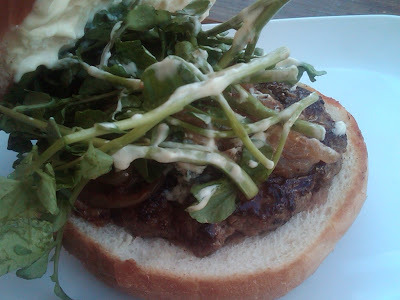 The Backyard Burger. Not a huge fan of the guacamole in there in place of the advertised avocado, but you really can't go wrong when there's that much bacon involved. 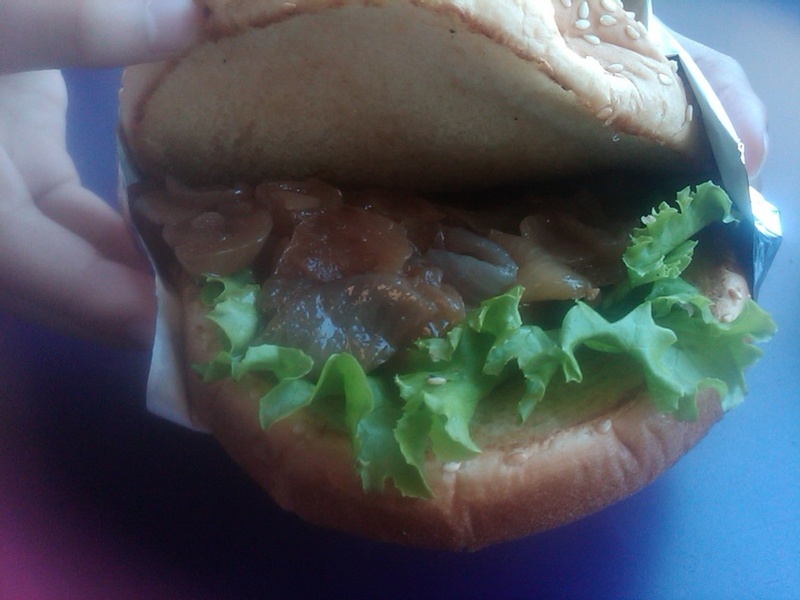 The red onions were also notably more pungent than some people liked. The homemade spicy mayo was marvelous, though. The burger came out well done, although we'd asked for medium, but we let it go so everyone could have a taste. The buns were absolutely delicious, golden, lightly toasted and just slightly sweet, quality one would expect from a team with this pedigree. The beef was excellent, too, full of meaty flavor and with a slightly coarse texture that lets you know it's been freshly ground. 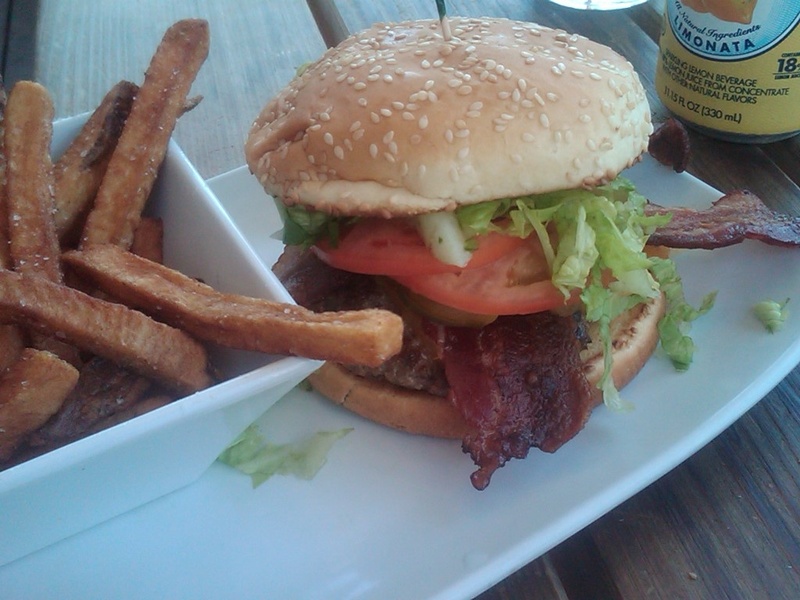 The lettuce was light and crisp, exactly the way lettuce on a burger should be. But somehow, in this instance, the whole was not quite as good as the sum of the parts, we agreed. 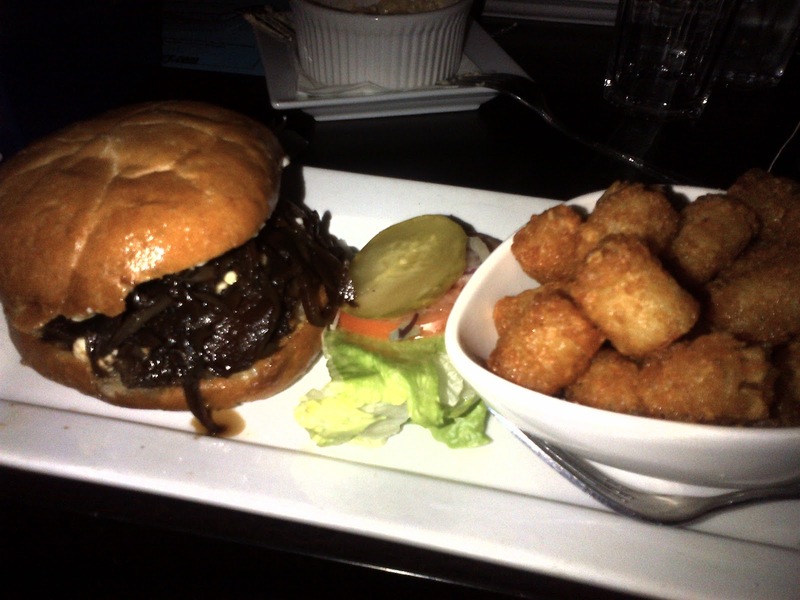 It was a very, very nice burger, but not amazing. The Short Order Burger, with grass-fed beef, griddled mushrooms, morbier cheese, lettuce and mustardy mayo, well done on purpose. I actually liked this burger better, maybe because I was put off by that guac. I could taste the beef more, and the mustardy mayo was full of whole-grain mustard seeds and had a tang that went really well with the rich cheese and bun. The mushrooms were also very tasty. The consensus? We liked it. Quite a bit. But we weren't going to go on and on about it. The Corn Pups, when they came, were just bland. We were all sorry we'd ordered them. I let the group know about the corn dogs at Disneyland for future reference. The Tuna Nicoise Raft on the other hand? Anything but bland. It was literally breathtaking. A toasted bun, topped with a hand-formed patty of loosely chopped albacore tuna, with a glorious mix of frisee, baby heirloom tomatoes, crisp haricot vert and briny olives in a garlic-y mustard vinaigrette, with a perfectly fried egg on top. Smashing! As FG14 said so well, "Anything with a fried egg on it makes me happy." It was a bit of a nightmare to get a workable bite off of the tower, but so worth the effort. This, far more than the burgers, seemed to have Nancy Silverton's style and flair for flavor written all over it. At $17, it's the most expensive thing on the menu, but this dish would command far more than that if it weren't being served on a burger joint patio. And then, there were our new favorite things. The Market Spuds. In the words of our server, "They take a baked potato. They shred it into little pieces. And then they fry it." Nuff said. She'd told us she often makes a meal out of the spuds and the special dipping sauce (bacon bits, sour cream with a little lemon, and scallions), and at $6 for the combo, every one of us would go back and do the same in a heartbeat. Not only are these piping hot little nuggets pretty much the only way I want to eat potatoes from now on, the portion very generously served four of us. Although we were kind of all fighting over the last little bits at the bottom. The Short Story? If you're at the Grove and looking for an upscale treat, stop by Short Order, and have the Tuna Raft (if you're splurging) or the Market Spuds (if you're not). Do you need to run right over there now? No. But if you order right, enjoy the sunshine on the patio, and save a little room for dessert (more on that in another post), you'll be glad you came. If you go, apparently the milkshakes are worth a try. Have one, and let us know what you think! Short Order is ON the list! 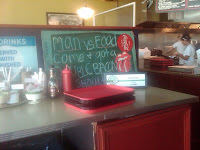 Pricing Info: Burgers $11-17, sandwiches & salads $8-15, sides $3-8, shakes $6, beer and cocktails available. FG Value Rating: Fair deal - four of us ate three main courses, the corn dogs, and the spuds for $18 apiece, including tax and tip. * "It's kind of an emergency" and "No, I'm not expecting again" will almost definitely cross my lips. But you'll never hear me offer to pop kale into a blender for you. I mean, get real! The is my lemon tree. This is my lemon tree, in bars.